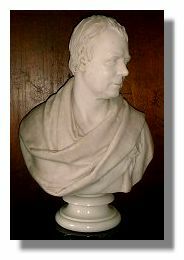 Although he was born in Edinburgh (in 1771), Walter Scott spent his early childhood in the Scottish Borders and developed a liking for the area. He also made many excursions into the Border counties on horseback - his "Minstrelsy of the Scottish Border" was first published in 1802. After qualifying as a lawyer and marrying the daughter of a French couple from Lyons in France, Scott was made Sheriff-depute of Selkirkshire in 1799 a post he filled until 1832). In 1804, the couple rented a house in Ashiesteil overlooking the river Tweed (and six miles from Abbotsford). 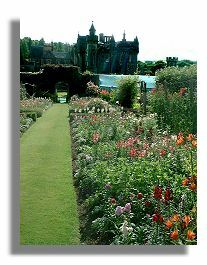 In 1811 he bought a farm on the banks of the Tweed totalling 110 acres. Although it was called "Cartleyhole", Scott renamed it Abbotsford as the land had once belonged to the monks in nearby Melrose. Over the years, Scott who was enjoying the financial fruits of his labours as a novelist, historian and poet as well as a lawyer, enlarged the house. 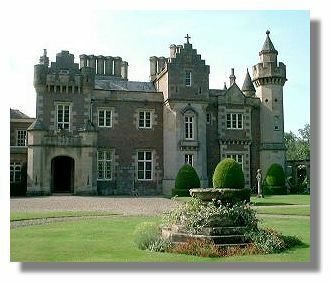 It was while living at Abbotsford that he wrote the series of Waverley novels. By 1820 he had been knighted by King George IV and in 1822 he organised the visit of the monarch to Scotland in 1822. For that event, he practically re-invented Highland society and clan tartans. Even the king was bedecked in false tartanry. In 1822 Sir Walter demolished the old farm buildings and created what is now the main block of Abbotsford. By this time, the estate had been expanded to 1,400 acres. But the expense of creating his "conundrum castle" as he called it, overstretched his finances and when his publishers and printers failed in 1826, he was nearly bankrupt. But he pledged to repay all his debts and worked prodigiously to clear the huge some (for those days) of £120,000. He wore himself out to pay off the creditors and indeed they were finally all paid after his death by selling copyrights to some of his works. 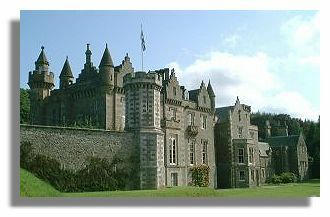 Abbotsford has been described as "Sir Walter Scott's greatest historical novel" as well as "an architectural monstrosity" and "a fantasy." Scott was involved in every detail of the building and its furniture - and his reading glasses are still to be seen in his writing desk in his study. Now a major tourist attraction, it was owned by descendants of Sir Walter who lived in parts of the house not open to the public until 2004 . Unlike the National Trust for Scotland properties where photography is not permitted, visitors are allowed to take photographs in the privately owned Abbotsford building. Even flash photography is accepted - which is just as well as some of the rooms are not brightly lit. As Sir Walter Scott was an avid collector of items with historical significance, it is not surprising that in addition to his writing desk in his study (where a secret drawer was discovered in 1935 which contained correspondence between Sir Walter and his wife before and after their marriage), there is a "Wallace Chair" made from wood taken from the House of Robroyston, where William Wallace was betrayed, and a portrait of Rob Roy. During his lifetime, Sir Walter Scott created a large collection of arms and armour. 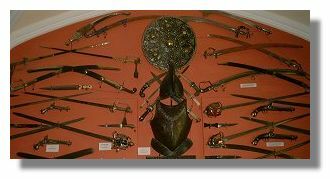 These are displayed in an armoury where the walls are covered in guns and swords and knives of many kinds. In addition to his own blunderbuss, sword and pistols, the display includes a pistol which belonged to Bonnie Dundee, Rob Roy's broadsword, dirk, gun and sporran purse. The picture here includes a Highland "targe" or shield. 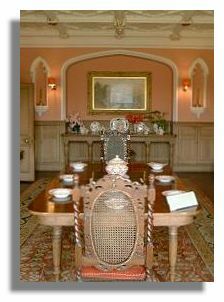 The dining room at Abbotsford is dominated by a table which was made from old oak trees from the grounds of Drumlanrig Castle in Dumfriesshire. The hand-painted Coulport dinner service on the table and on the dresser belonged to Sir Walter. The walls in the dining room are adorned with a number of portraits, including one of the author's great-grandfather, also Walter Scott who earned the nickname "Beardie" because he refused to shave until the Stewarts returned to the throne. "Beardie" had fought for the Jacobite cause in the 1715 Uprising. Other portraits include Sir Walter's grandmother, Barbara Haliburton, his French wife Charlotte Charpentier, his younger daughter Anne and his great-great-grandson, Major-General Sir Walter Maxwell-Scott. Sir Walter Scott died in the this dining room on 21 September, 1832. 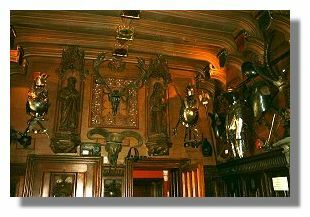 If the outside of Abbotsford was intended to give the impression of a medieval castle, the entrance hall certainly carries on that theme with oak panelling (from the Auld Kirk from within Dunfermline Abbey), armour and crests of the Border families round the cornice and the arms of Sir Walter's ancestors running down the centre of the roof. There are statues of St Andrew, St Peter and St Paul high on the walls, along with armour and weapons. Also on display are two cannonballs, said to have been used in the siege of Roxburgh Castle in 1460. In Sir Walter's study and his library are lined with around 9,000 books which were collected by Sir Walter during his lifetime. The richly moulded ceiling in the library is copied from Rosslyn Chapel. Items of interest on display include a pocket-book worked by Flora Macdonald, a lock of Bonnie Prince Charlie's hair, Rob Roy's purse and a tumbler owned by Robert Burns with some verses scratched on it. Burns met the young Walter Scott in Sciennes House in Edinburgh.